Well, I’m seriously behind again. I just spent a month camping without internet access in New Mexico (at Hyde Memorial State Park near Santa Fe, then El Vado and Heron Lake State Parks in north-central NM) and in Colorado, boondocking near La Manga Pass on Hwy 17. I could only get online for an hour or 2 when running errands in Santa Fe with Chris, or hiking to a mountain ridge, or driving to the Chama Visitor Center to use their WiFi. Of all the things I needed to do online when I had the connection (email, banking, campsite research, finding propane, etc. ), blogging was lower on my priority list. Sorry! I’ve been going through the pictures I took at Yosemite National Park and it’s been a major task to single out a limited number of pictures from the 500+ that I took. One thing that I hadn’t expected is how the beauty is all around you in Yosemite Valley. It’s not a park where you have a spot in the campground and drive or hike to the viewpoints. Half Dome is right above the campground and viewable from all over. You see Yosemite Fall almost anywhere. It’s a short, skinny valley with steep walls all around, so the views are always there, wherever you are standing, unless blocked by the tall trees. Like Bryce Canyon NP and Zion NP, I was taking pictures non-stop. As I mentioned previously, I stopped at the Escapee park in Coarsegold the day before my 3-day reservation in Yosemite (April 28-30). It’s located off Highway 41, just south of the Yosemite entrance near Wawona. I needed to do laundry and the Escapee co-op parks usually have clean, reasonably priced laundry facilities. Also, I wanted to be sure to have a cable connection or TV signal to watch the NASCAR race that night. While there I got to meet Lorna, a Lazy Daze owner, former travel blogger and the organizer of the annual Lazy Daze ladies get together (Ladeze GTG). She isn’t full-timing right now and is enjoying living at the Coarsegold park. Such a neat lady, and it’s always great to meet folks I know from blogs or the Lazy Daze board. Coarsegold is a nice park with lots of hills and trees. The sites aren’t lined up like sardines. I could see myself in a park like that after stopping full-time traveling. My original plan was to visit Yosemite in mid-May. Bob Wells had given me a lot of good advice back at the RTR in January, including when to visit for good waterfalls and wildflowers, photography tips, etc., but that I had to book ASAP. 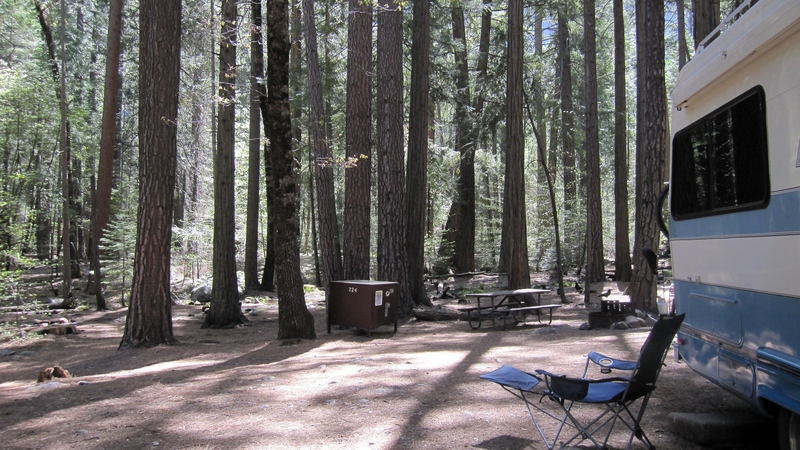 The campgrounds book up within hours of the reservation system opening, and reservations for mid-May had opened on January 15th. I was able to get 3 nights, May 21-23, but had to book 3 different campsites. I would have to move each day, but that didn’t matter as long as I had 3 nights in Yosemite Valley. Back when I was at Lake Isabella it got hot pretty quickly and I decided to check on Yosemite. The weather was forecast to be unseasonable warm there, too. 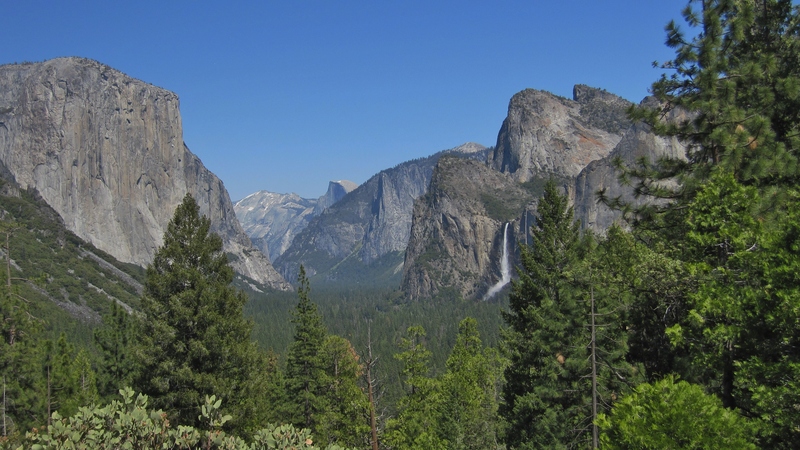 (Unseasonably warm in Yosemite meant high in the high 70’s and lows in the low 40’s – dee-lightful!) And, I had read that the rivers and streams were really flowing due to early snow-melt. I decided to change my reservations to April 28-30. I expected we would have good weather and low crowds since school wouldn’t be out yet. It cost about $30 to change the reservations, but worth it. So, I left Coarsegold and headed up highway 41 to Yosemite’s south entrance. 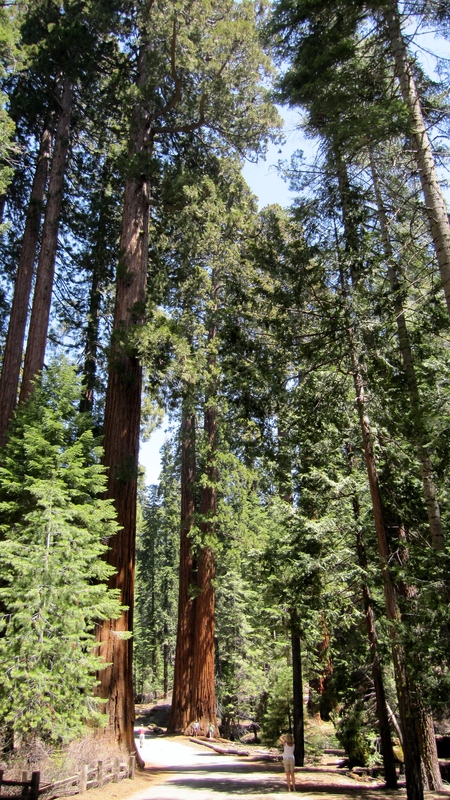 One of the main things I wanted to do in Yosemite was visit the Mariposa Grove of Giant Sequoias. Unfortunately, I couldn’t park nearby. They had everyone park 8 miles away at Wawona and take a shuttle to the grove. Riley had to stay in the RV, since dogs aren’t allowed on trails or buses. The size of the trees are mind-boggling. It’s a nice area, with a paved trail and informational sources. And, of course, very shady and cool. Back at the rig, we headed on up Hwy 41 and enjoyed a really pretty drive to Yosemite Valley. Friends Steve and Barb Smith back in Texas are from California and told me to be sure to stop for the Tunnel View, that it was outstanding. After about an hour we got to the long tunnel. Immediately at the end are parking lots on each side of the road for the viewpoint. I pulled in to the lot on the right side of the road. That was the wrong side, as I found out later the lot on the left side of the road has the RV parking. (Just an FYI for RV’ers.) Fortunately I am short enough at 22′, and was able (barely) to park in a regular spot. Tunnel View. Not great lighting at 3PM. I would visit this site the next day at sunset for better pictures. It is a spectacular view, with Bridalveil Fall gushing and highly visible, El Capitan on the left, and Half Dome to the back. Then, the drive to the campground is lovely, cruising along the valley among all the trees in the picture above. You can’t even tell there is a road down there, it’s hidden in the forest. When we got to the campsite I got parked and noticed there was a seasonal stream winding along the back boundary of the campground, right behind our site. It was a great site, very shady with flowering dogwoods. 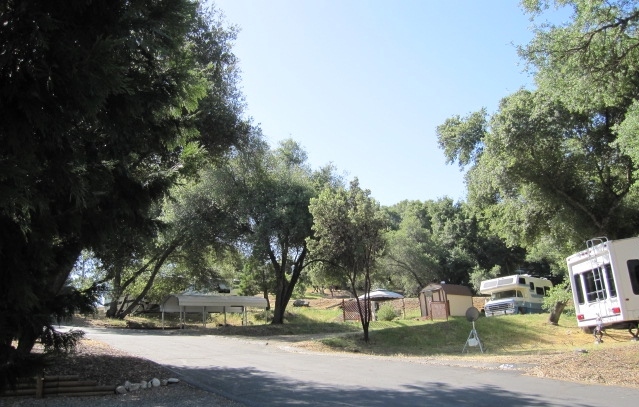 I could hear the Merced River rushing behind the campground – it was probably just a hundred yards or so behind my site. By the time I got parked and set up it was about 4:00. I took Riley for a walk around the campground and along the Merced River. It was so late in the day there wasn’t really time to do much, but I decided to hop on the Yosemite free shuttle and ride it around to get familiar with the valley. There is a stop right at the campground entrance. I got off at Yosemite Village to visit the general store, then at Yosemite Fall. I have about 45 or so photos of our time at Yosemite, so am dividing into 3 posts for the 3 days of our visit. Will post day 2 soon. 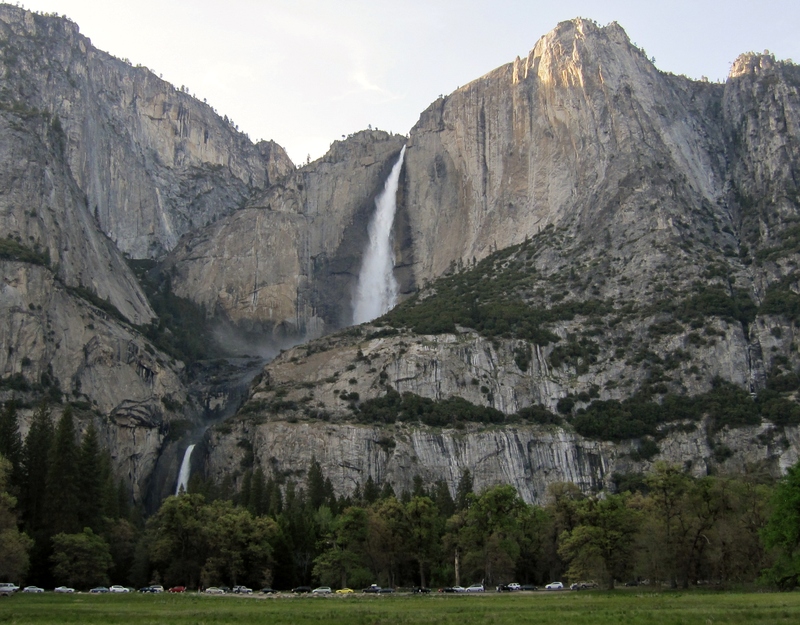 This entry was posted in California, National Park Campgrounds, National Parks, Yosemite and tagged Coarsegold, Half Dome, Merced River, Upper Pines Campground, Yosemite, Yosemite Fall by ontheroadwithriley. Bookmark the permalink.